IFA 2015: Lenovo announces YOGA Tab 3 8", YOGA Tab 3 10" and YOGA Tab 3 Pro (world's first 70" projector tablet). Lenovo today unveiled the latest line-up of YOGA tablets, the YOGA Tab 3 Pro and YOGA Tab 3 (8" & 10"). 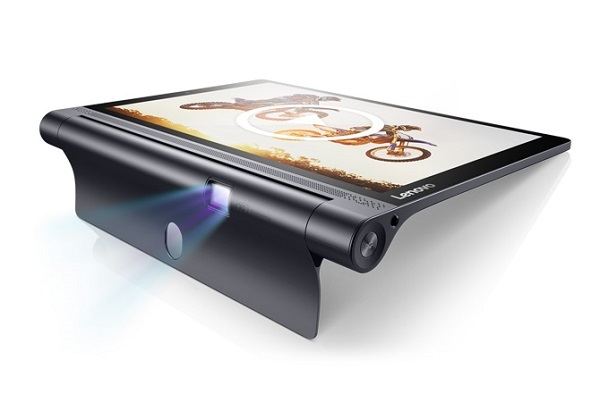 The Lenovo YOGA Tab 3 Pro is the world's first multimedia tablet with a built-in 70" projector. Lenovo YOGA Tab 3 Pro is available in Puma Black, and the 8" and 10" YOGA Tab 3 comes in Slate Black. The series premier offering - YOGA Tab 3 Pro - boasts a built-in 70" projector and is optimized for Netflix. The tablet flaunts a better optimized projector placement and is now 180-degree rotatable to beam life-sized images onto a wall or ceiling and project significantly brighter and cinematic pictures up to 70" wide. At 299 pixels per inch, the onboard 10.1" QHD (2560x1600) screen is considerably sharper, and renders richer colors with its Smart Display technology. The YOGA Tab 3 Pro features four front-facing powerful JBL speakers, and for the first time ever, a virtualized Dolby Atmos experience over built-in speakers that creates a sensation of sound moving in all three dimensions around the listener. The YOGA Tab 3 Pro also features Dolby Digital Plus. Loaded with Smart Window 2.0 for enhanced multitasking, users can now do more things, faster. The YOGA Tab 3 Pro allows you to run a background app as well as two windows on top, with the added benefit of phone apps layout to easily fit everything on one screen. Email, news, YouTube - enjoy it all at once! 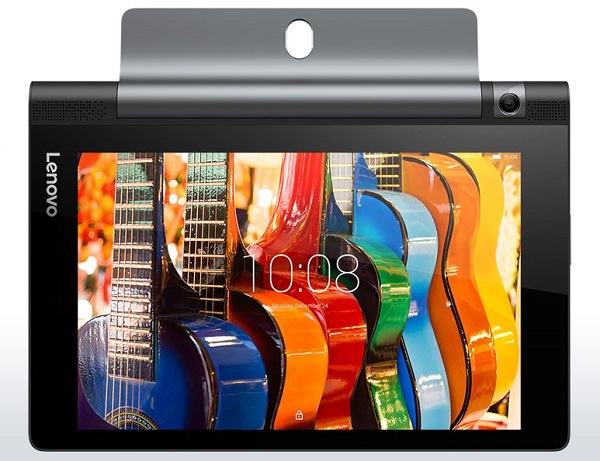 Lenovo YOGA Tab 3 8" & 10"
YOGA Tab 3 8" & 10"
Additionally, the YOGA Tab 3 8" and 10" models are available in 8" and 10" screen sizes. The YOGA Tab 3 is the best go-anywhere video tablet with a long battery life and LTE support to let users stay connected anywhere, anytime. Both models are primed for video and multimedia applications and unparalleled portability, equipped with an HD (1,280 x 800) display, front-facing stereo speakers with Dolby Atmos sound, and yet weighing as little as 466g. Through the 180-degree rotating camera, users can unleash creative selfies and invigorating photos at previously unachievable angles and unique perspectives. Built-in gesture control also makes capturing the perfect shot easier than ever before. Simply open and close a hand to take a photo. With the highest-capacity battery in its class, these tablets also have a staggering all-day battery life. The YOGA Tab 3 8" retails at €199 (WiFi) and €249 (LTE) from October, YOGA Tab 3 10" at €299 (WiFi) and €349 (LTE) from November and YOGA Tab 3 Pro at €349 (WiFi only) and €599 (LTE) from November, available at all Lenovo Retail Partners.